Home Uncategories USA said to Philippines – leave Panatag Shoal to China; Navy supposed to fight for Panatag. USA is selling Panatag to China for their debt.. ? USA said to Philippines – leave Panatag Shoal to China; Navy supposed to fight for Panatag. USA is selling Panatag to China for their debt.. ? This article could be annoying but this could help each readers to think some possibilities. "Rebuilding for the Better Philippines" is not also anti Americans but we are just trying to figure out everything to give light some issues hidden by the government to the crying public. The Philippines could be a victim in this case. 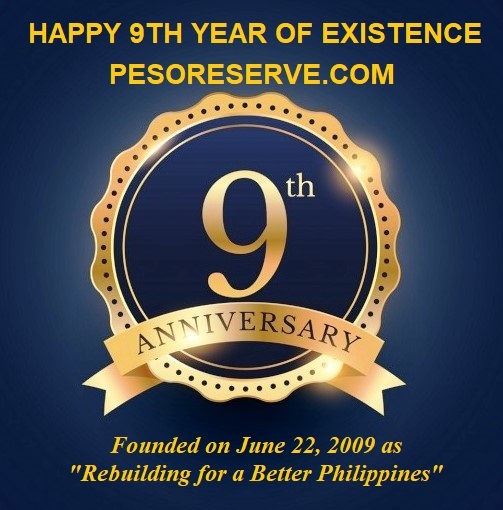 USA Trillion Dollar Debts in China quits for selling Panatag shoal, a Philippine Island? According to the About.com –US Government Info, the U.S. debt was more than $14.3 trillion during the so-called debt crisis of 2011, when the level of borrowing reached its statutory limit and the president warned of a potential default if the cap wasn't raised. So who owns all that U.S. debt? About 32 cents for every dollar of U.S. debt, or $4.6 trillion, is owned by the federal government in trust funds, for Social Security and other programs such as retirement accounts, according to the U.S. Department of Treasury. 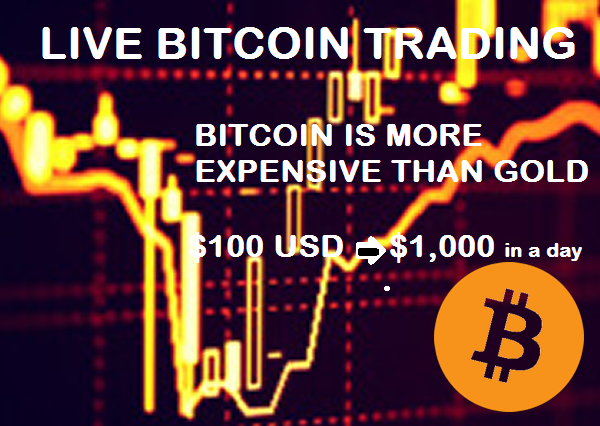 The largest portion of U.S. debt, 68 cents for every dollar or about $10 trillion, is owned by individual investors, corporations, state and local governments and, yes, even foreign governments such as China that hold Treasury bills, notes and bonds. Foreign governments hold about 46 percent of all U.S. debt held by the public, more than $4.5 trillion. The largest foreign holder of U.S. debt is China, which owns more about $1.2 trillion in bills, notes and bonds, according to the Treasury. In total, China owns about 8 percent of publicly held U.S. debt. Of all the holders of U.S. debt China is the third-largest, behind only the Social Security Trust Fund's holdings of nearly $3 trillion and the Federal Reserve's nearly $2 trillion holdings in Treasury investments, purchased as part of its quantitative easing program to boost the economy. To put China's ownership of U.S. debt in perspective, its holding of $1.2 trillion is even larger than the amount owned by American households. U.S. citizens hold only about $959 billion in U.S. debt, according to the Federal Reserve. Other large foreign holders of U.S. debt include Japan, which owns $912 billion; the United Kingdom, which owns $347 billion; Brazil, which holds $211 billion; Taiwan, which holds $153 billion; and Hong Kong, which owns $122 billion. Some Republicans have expressed concern over the amount of U.S. debt owned by China. Republican U.S. Rep. Michele Bachmann, a 2012 presidential hopeful, joked that when it came to the debt "Hu's your daddy," a reference to Chinese President Hu Jintao. Despite such joking, the truth is the bulk of the $14.3 trillion U.S. debt - $9.8 trillion in all - is owned by the American people and its government. Pres. 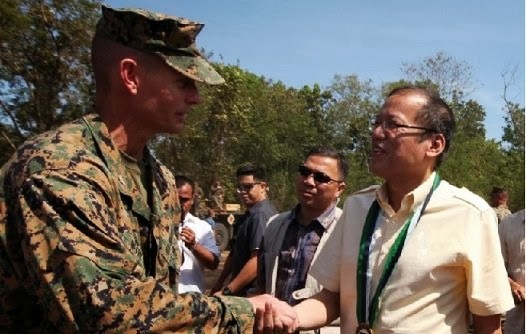 Aquino greets Col. Stephen Neary, commander of the US Marines participating in 2011 Balikatan exercises. A Commentary written by by Ellen Tordesillas published in Yahoo News titles "U.S to Ph: stop anti-China rhetorics" gains criticism by the Pro Pnoy supporters as it tried to give light of the hidden agenda of China's take over in the Panatag Shoal, Zambales Province. Many, including high-ranking Philippine officials, like to think that increased presence of American military in the Philippines, which is a subject of talks between the two countries starting today, is a commitment by the Americans to defend the Philippines in case of an armed conflict in the West Philippine Sea, where a number of islands are being claimed wholly or partly by the Philippines, Brunei, China, Malaysia, Taiwan and Vietnam. Those who have taken these view will be disappointed because the U.S has taken a neutral position in the conflicting claims in the South China Sea (part of it is referred to as West Philippine Sea) and has always been consistent in urging for a peaceful resolution of the conflicting claims. The Obama administration has decided to rebalance its military forces from Middle East to Asia, in what is seen by analysts as a move to contain China's hegemony in the region. But as former UN Representative Lauro Baja, Jr. observed, the Americans do not want to 'vulgarize' this objective. In increasing its presence in Asia, the United States does not want to play referee to countries fighting over islands, rocks and shoals. "They want a stable region. They don't want to prejudice their strategic relations with China, which is more important than claims over rocks and shoals," Baja said. In preparation for the implementation of their Pivot to Asia policy, senior American officials have been coming here the past months and assessing the situation. One thing that they were concerned about is the tension between the Philippines and China over the disputed islands especially Bajo de Masinloc otherwise known as Scarborough Shoal or Panatag shoal and lately the Ayungin shoal. The Philippines has filed a suit with the UN Arbitral Court questioning China's nine dash-line, which encompasses the whole South China Sea including several countries' territories. A source said some of the analysts interviewed by American officials said that the "Shame China" strategy of the Department of Foreign Affairs under Foreign Secretary Albert del Rosario has contributed largely to the deteriorating relations between the Philippines and China. Del Rosario has, several times accused China of "duplicity and intimidation." Malacañang spokesperson Edwin Lacierda has also made sure that he is not behind in China-bashing. In the 2010 and 2011 State-of-the Nation address by President Aquino, he had strong words against China. In his 2011 SONA, Aquino, declared: " There was a time when we couldn't appropriately respond to threats in our own backyard. Now, our message to the world is clear: What is ours is ours; setting foot on Recto Bank is no different from setting foot on Recto Avenue." He was referring to the disputed Recto or Reed Bank near Palawan. In his 2012 SONA, he talked lengthily about the situation in Bajo de Masinloc. He said, "We demonstrated utmost forbearance in dealing with this issue. As a sign of our goodwill, we replaced our navy cutter with a civilian boat as soon as we could. We chose not to respond to their media's harangues. I do not think it excessive to ask that our rights be respected, just as we respect their rights as a fellow nation in a world we need to share. "There are those who say that we should let Bajo de Masinloc go; we should avoid the trouble. But if someone entered your yard and told you he owned it, would you agree? Would it be right to give away that which is rightfully ours?" Aquino can be stubborn. But he listens to America. Last year, a month after he withdrew all the ships from Bajo de Masinloc, he, supported by the majority of the members of his cabinet, decided to send back the ships to the area which was by then already controlled by the Chinese. Upon learning of Malacañang's decision, the U.S. relayed the advice through defense officials that it would not be wise to send back the ships to Bajo de Masinloc . The ships were not sent back. Our source said, two weeks before the President's State of the Nation address, U.S. officials advised the DFA and Malacanang to tone down their anti-China rhetorics to reduce tension in the region. That explains why in last month's SONA there was no mention, not a word, about conflict with China. Last Aug. 2, Del Rosario, who never let any media opportunity to censure China pass, told members of the foreign correspondents association in the country, that he was not keen on guesting in their forum on the South China Sea because he was "looking for a modus vivendi with China." China should thank Uncle Sam..